I expect this will be the most difficult swap we did so far. We have two cities, a weak army and barely any money. If we build up our army, rome will grow too much, if we go to soon our men will be no match for roman infantry. I think there are a few things we should focus on (I have no experience playing with pontus, so perhaps I'll make some erros of judgement). Eastern infantry is no match for roman infantry, so I think we should mostly focus on archers and cavalry. I think we should recruit a lot of light cavalry, who can flank the romans and throw javelins in their backs. Also take 1 or 2 chariots if we can recruit those, they will weaken their morale. And save money to hire cretans and merc hoplites. I would need to build up to a blacksmith to get chariots, so I don't think that's happening. Also, not only do I hate using chariots (unreliable buggers), but Pontic chariots have an unfortunate tendency to run amok. You're right. We will need to move withing 10 turns, so chariots are probably out of the question. Too bad. I hate them as well, but if you keep them out of contact, they will lower enemy morale and you can keep them back untill the finishing attack. Does pulling them off the line help with the running amok thing? For example, use them to take out missile troops them pull them back to reform at a safe distance then rinse and repeat as youy see fit. That would be how I use them. Cuts down on their time in the battle and prevents them getting in the way of the infantry or bogged down in close quarters attle. I would charge them in the rear of the enemy line at the moment they are already hard pressed, to finish them off. But since chariots are out of the question in the beginning, I would use the light cavalry to draw out single enemy units, likely first their general or equites, once drawn away crush them with our generals, or in case of infantry, have one cavalry run away and one in the backs of the infantry. Have the one in the back on fire at will, the other saves its ammo. Once they turn, switch roles. Once a unit of hastati is down to about 40 men, a general charge should easily sweep them away. I think that will be our best shot at defeating the romans. Meanwhile our cretans can do damage to the main line, protected by a few hoplites mercs. Anybody has better ideas to beating the romans? Were not facing the seleucids or Greeks, were going to migrate to Italy. If we move soon enough we can avoid wars with those two, and they will likely not hinder our movements towards Italy. 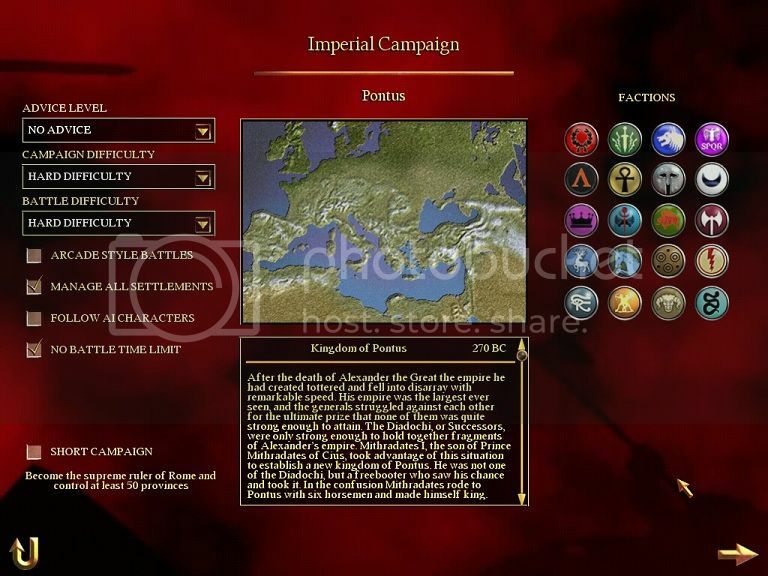 And eastern infantry vs hoplites, Im not surprised. Eastern infantry are good only vs peasants, town watch, other eastern infantry and if lucky they can hold off warbands a while. And light melee cavalry will also die quickly due to the high number of spears. What route west are we planning to take? Overland through Armenia and Scythia, or across the water through Thrace and Macedonia, or direct east through the Greeks and then to Brutish territory? It might be an idea to build up a good army and conquer a bit before relinquishing our Eastern cities. I'm currently using Sass's guide on migration campaigns to help with my strategy. As to our movement, I'm planning to load everyone on boats soon, go through the Bosporus, and then on to Crete. From there, we will be in a good position to attack Italy from the south, starting with the Brutii. You should at least conquer someone. Can't get better units without better buildings and to get better buildings you need to buy them with money. Unless you plan to cheat for denarii? Go through Greece for the trade gold mine. Also gives you a closer base of operations in case you get beaten on Roman turf. Unless the challenge of this is to crush everything with crappy units? So, I begin by training two units of peasants; they're cheap and about all we can afford right now; I managed to almost break even the first turn. I also move our diplomat and spy west for the time being, simply to see what lies around us. In our next turn, we have a young son come of age; Spartocus, a decent commander; perhaps he shall become a great one with time? This turn, since I'm building extra biremes, we lose a bit of money. I move our agents, the spy still heading west, our diplomat east, and end the turn. We're still losing money, but I've found a way to remedy that: selling trade rights and map info. I've also consolidated all of our forces in one army and we're about ready to head off. Gaining some money this turn, it's time to set sail, destination: Crete. I've also moved our diplomat further east; hopefully we can secure some more lucrative trade relations and alliances. We leave behind our two towns, with a brace of peasants each as garrison. Here in our next turn, our treasury is pretty stable. We're making our way through the Bosporus, and there's a pirate ahead, picked out by our spy. At the end of the turn, we're about to leave the Black Sea, with out two towns still happy and making money. Moving through the Bosporus, the pirate has decamped, at least for now. We also talk to the Egyptians, and apparently, even though we're on hard here, they like us enough to give us 1,000 denarii for the privilege of becoming our ally. This gift gives us a major surplus the next year, and puts in good shape as we approach Crete. I have our speaker of words headed further east now, hopefully to find the Parthians. So far, our home cities are still intact, with no armies threatening them. As we end the turn, the Armenians want to talk to us, and, figuring it's worth a shot, I ask for another 1,000 denarii for trade rights. Amazingly, they accept. This turn, we receive a message that one of the daughters of our family has found a husband; I accept, but realize that he has shown up in our capital. Since the Armenians have moved an army near and blockaded our port, I decide to move him west, to meet the rest of our army. As for that army, we have finally, we have reached our halfway point, Crete. I land our army and hire as many mercenaries as I can. The next turn, I receive another offer of marriage, but since that would mean another family member at our capital, I regretfully decline. Because of the mercenaries I've hired, we're lose money, although that's to be expected. Back at the capital, apparently the Armenians can't make up their mind to attack and are simply walking past it. Adding another Mercenary Hoplite to our forces, I attack Kydonia. I begin with a fairly standard formation; skirmishers and slingers in front, infantry in a line, archers behind, cavalry on the flanks. As soon as I begin, the Cretans open up on the Cilician Pirates (gotta love the range on Cretans). I hate skirmishers almost as much as I hate chariots, but we have a large number of heavy cavalry, so I begin moving to flank the phalanx. It's then that I notice where one of their Cretans is; when it opens up on our Rhodian Slingers (that range again) killing 13. Figuring that a missile duel is stupid, I charge them with three generals; even on hard, that should work. It does, and I wipe them out to a man. Then, the remaining Cilician Pirates make a run towards my cavalry. Not a good idea for them; I wipe them out. That leaves only the Militia Hoplites and Cretan on the Sacred Square and half a unit of Militia Hoplites on the outside road. I cut the latter down with archers and missile cavalry. Now it's time to face the last two enemy units. 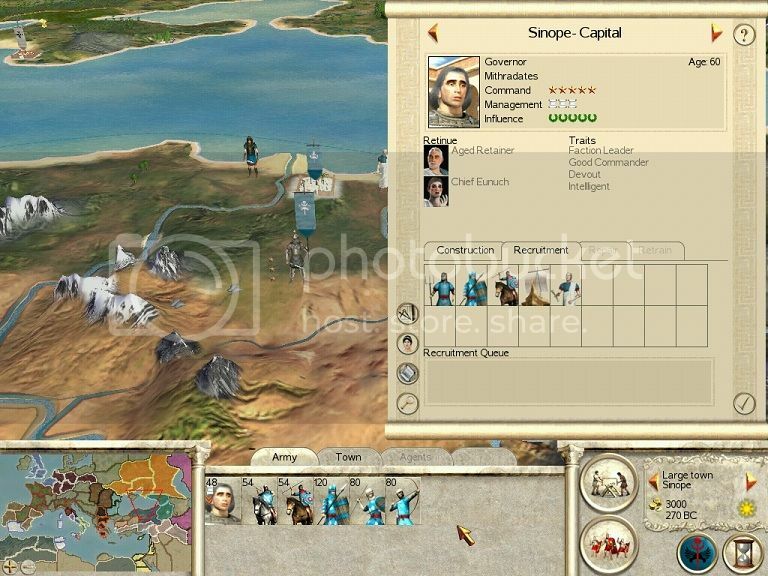 Instead of engaging in an archer duel, where the enemy's two experienced Cretan has an advantage, I move my generals and Pontic Heavies up; the Cretans can't compete with that heavy an attack and I wipe them out. This leaves the final unit of Militia Hoplites; I pull off the cavalry, using up their ammo and bring up the archers and infantry. When I open up, the AI waffles in its usual manner and I take them out handily. This gives us a rather good result, with minimal losses. This gives us Kydonia, which I exterminate, needless to say. We're still losing money at the end of the turn, and Armenia attacks Mazaka on the flip. We lose more money than expected, but are still in the black. I move our diplomat and family member and end the turn. As thinks now stand, we've just gone into debt, our diplomat has reached Parthian controlled Seleucia, our army is on Crete, and our boat is stuck behind a Greek one. On to the next general, Alex David. Edit: I think I played an extra turn by accident. By the way, in case everyone is waiting for a new post, see above (I edited it). Going straight for Rome would be fun too, probably suicidal though. I think Brutti are indeed the best traget, they are at least far enough away from SPQR armies to intervene. That was a great read. What happens next? Do you send the save file to the #2 guy on the list and he carries on from where you left off? Anyway, looking forward to the next guy to post. Sparta has little to offer us. It might have a good barracks, but what infantry do we have that we want to retrain. If we fight Greece at all, we will hit them with missiles and finish them off with our generals. The only benefit from it that I see is its plunder, and we can destroy all buildings to gain money, since we cant leave a garisson. So how you gonna beat Rome? Better to have a solid base of operations with good facilities in case it all goes wrong and you lose to the Roman factions, than it is to have to leg it back to Crete with no money and no facilities and probably ending your game. And it can go wrong, in my first attempt with Thrace my ships were sunk by pirates before I got out the Black Sea. Everyone died. Plus, Sparta is slightly closer to Italy than Crete is. Shorter trip. Got more mercs in Greece too so even if you don't go for Sparta you can fill up on mercs. Italy doesn't have any mercs. We beat Rome with the army we've got. It should be possible with good tactics. The idea of this campaign is not just to conquer italy, but to migrate to Italy. Taking many cities in between would make it little different from other campaigns. Besides, declaring war on Greece would only increase the chance of losing our navy. And since our entire military capacity will be on those ships, losing them means almost certain forced loading a previous save game. Though we might have a slight chance to survive with just crete, conquest would be hard from there, with no starting army. For svaety reasons and mercenary reasons, we should however disemerk on land at the end of the movement limit. Actually the fun in this campaign is for me that the odds are quite against us. We will have to succeed in Italy, or lose. Sadly by the time I get to play, I think we should have at least some kind of basis in south-Italy, Greek coast and Sicily and the game would have turned into a more conventional game. Tactics only get you so far. That stacked unit outside Rome has about 5 Generals, a dozen units of heavy infantry (Legion Cohorts), heavy cavalry, archers, etc. Professional soldiers in other words. Your army is made up of mainly light troops who are part-timers with low morale and get routed easily. Mercs will only get you so far. I would have spilt my forces, one goes up from the heel and the other from the north. This would pin down Julie while you main force deals with Skippy/Brutal. Make an Alliance with the Gauls and it would be even better. But whatever, you don't seem to like ideas and suggestions. Your army is made up of mainly light troops who are part-timers with low morale and get routed easily. Mercs will only get you so far. Actually, mercenary troops have not better or worse moral than their normal counterparts; however, our army is not ready to take on the Senate; hence why we should head for the Brutii, who will likely have half their armies in Greece already and make easier prey. Taking Croton and Tarentum will give us a strong base of operations to move against Capua and Rome, hopefully with a bit better troops. Remember, "march divided, fight concentrated". We barely have enough combat power to take one city as it is, let alone two Roman cities; we need to stay concentrated, with an army big enough to overwhelm any one enemy army. I find them most welcome; sometimes a fresh perspective will point out something the rest of us have missed. Also, if you want to have a turn as Supreme Commander, let me know and I'll put you on the list. I think its mostly that we differ on what a migration campaign is. Taking crete doesnt really matter, plundering sparta, fine as well but occupying it would mean abandoning the idea of migration in my opinion. Not to mention it might delay us 1 or 2 turns in arriving on Italian soil, which gives the romans more chance to grow and thus harder to beat. We only have one army and splitting that up in an attack upon julli and brutti will not help us. Our entire army has a good chance to beat the Brutti. With their cities we will have economy again, and can train new units. Perhaps our initial army might even take capua as well. Facing the SPQR army might require a bit more preparation. But once we have phalanx units, we can occupy the ford near Rome and then their numbers and generals will be useless, once they are stuck on a wall of spears, with their knees in the water and missiles raining down on them. But we might succeed in taking out the Julii before taking out SPQR, by first attacking their northern provinces, by then likely they have taken patavium and mediolanum. Arretium and ariminium sometimes get help from the SPQR though. Did the save get passed to the next one in the first place? I think the save got passed to me, but I'll need sometime to get started, maybe a day or two. RL issues. Sorry, but I'm not going to be able to play for the coming three days. Please pass on the save. Alright, I've passed it on to Average Citizen. I look forward to seeing what he does. You looking to sign up? Not really. I have my finals in three days and I thought I could finish my reign but I just couldnt. I've been into several swaps and have helped in getting us out of impossible situations, but this is going to be challenging. Its impossible to get Rome so early on unless we go for the Brutii and take Greece. Everyone knows conquering Greece could greatly help our poor economy. Sajaru! I fear my days of leading soldiers in Rome are so far behind me I would be of little help. I'll sit this one out unless a bunch of people start dropping out. Ah, well then that makes perfect sense! Please don't tell me the Swap died so early on. It sometimes goes into hibernation though, when the current general forgets to send it in, and the cherub leading the game gets busy with Real LifeTM and doesn't realize the scepter has not yet been returned. Then the Old ONe steps in and asks: who has it now? And who is next? Ehm, Alex, you had the save right? You have not yet reported your results here. And did you pass on the save? But if it got passed on, why didnt the previous commander report how things went? That's the basic idea of swap games on rtwh. Its because I didnt play my turns Thompsoncs. Then I guess it is time to assume that the mind of Average Citizen was sucked into the Vitrual World and eaten alive by the harpies and dragons. Until he replies, we must assume the worst. Thus I would suggest sending the save that went to him on to the next commander in line. That way we lose nothing but a bit of time, and can keep the lifeblood of conquest flowing heartily through our veins. I've sent Average Citizen an email about it; if he doesn't reply shortly, I'll pass it on to Thompsoncs. Received, though not at the best of times. I will send it back and report somewhere in the next week. Small update: We're in south-Italy, which was as expected nearly empty since the romans there were on a cheap holiday to Epirus. Our homeland is gone, but we still have Crete, about half our naval power and about 95% of our armies. I took Tarentum as soon as the ram was ready. Then moved to take Croton, but Scipii attacked Tarentum, which had just enough men to keep it from rioting. I left one unit to hold the siege of Croton, the rest attacked Scipii. My garrison was on the opposite side of the battlefield, and was split in 2 by a lake. The ai was nearly smart enough to attack it, but my cavalry routed theirs and killed their faction leader. The infantry was then mopped up and victory is ours. I will now assault Croton, and if public order allows it, I will move on Capua. Then I will pass the save to the next. Ok, I took Croton, with only bodyguard casualties. I exterminated, to allow an army to move out for conquest. I reached Capua and laid siege. A stupid town watch unit then moved adjacent to the city. I lifted the siege and attacked the unit, luring the romans to the field. I quickly took out the town watch, then hit the general with some bodyguard and killed him. The second general had some hastati near him, but a charge in the rear made him fight to the death, and death he found sooner rather than late. The infantry was easily routed with their leader gone, and the city was mine without having to assault it, which would certainly have cost more men. Now I only lost bodyguards. I exterminated Capua to ensure public order (should have done that with Tarentum too). I did probably go a bit over my turns, but the first bit was really quite boring, took very long to get the ships to Italy, and only thing to fight boredom was fighting hopeless peasant battles in our homeland. And pics!. The order seems a bit messed up, but anyway.